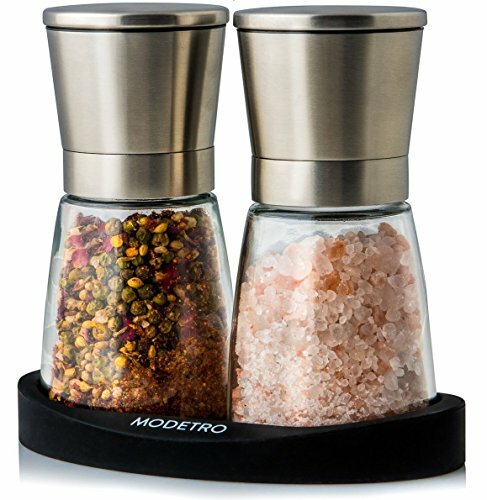 What Are The Best Salt And Pepper Grinders On The UK Market? 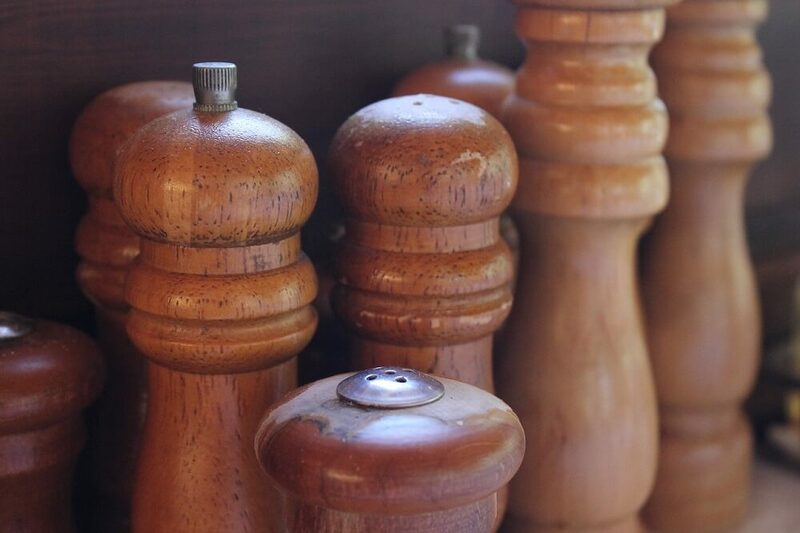 A salt and pepper grinder is an easy and quick way to add fresh spices to your dishes. Unlike pre-ground spices, freshly ground pepper gives your food a stronger flavour. You also need less of it, which saves you a bit of money. As for salt, grinding reduces the large crystals to a fine dust that is better for flavouring certain foods. You can use those free plastic grinders that come with spices but they don’t last very long. They also do a poor job grinding spices. A good quality salt and pepper grinder provides a consistent grinding size, is easy to use and provides several grind size options for different culinary needs. They also last longer without wearing down. Below, we’ve reviewed the five best salt and pepper grinders. To pick the best ones, we looked at various factors like ease of use (especially for those with hand mobility problems such as arthritis), durability and even aesthetics. But before we get to the reviews, here are a few things to keep in mind when shopping for a salt and pepper grinder. What to Consider when Buying a Salt and Pepper Grinder? One of the first things to check is whether the grinders come with adjustable settings that allow you to change how finely the salt or pepper will be milled. Different grind sizes are ideal for different situations. A fine grind gives cooked food, soups and sauces an even flavour. A coarse grind works great for marinades and certain foods like roast meat. Some grinders can have as many as five settings for an extra-fine grind. Next, consider whether you want a manual or an electric grinder. Manual grinders are the most common. You operate the grinding mechanism by rotating the top part of the mill. But they can be difficult to use if you are disabled, have arthritis or carpal tunnel syndrome. Get an electric grinder instead. Electric salt and pepper grinders are powered by a battery. You just need to press a button and the grinder does all the work. As with manual grinders, many battery-operated grinders also come with variable grinding settings. If you are getting a manual grinder, make sure it is easy to use. It should have a sturdy body that is easy to grip. The grinding mechanism should be easy to operate and should crank out pepper or salt quickly. If you have a health problem or disability that prevents you from properly operating a manual grinder, I highly recommend an electric alternative. Check how big the grinder jar opening is. Some are so small that most of your peppercorns end up on the floor rather than in the jar. Some grinders also leave a mess on the table after you finish grinding. The leftover pepper or salt in the grinder falls on the table. To avoid this get a grinder with a milling mechanism located at the top. Alternatively, get a grinder which is designed to be stored upside down when you finish using it. Stainless steel grinders are the best. They last long and can handle tough spices and hard salt crystals. They are usually coated with other metals like chromium and nickel to prevent corrosion and avoid metal bits in your food. Ceramic grinders are more common. They are very durable and do not have any corrosion problems like steel. Nylon grinders last the least amount of time. Avoid them unless you just need a cheap temporary grinder. 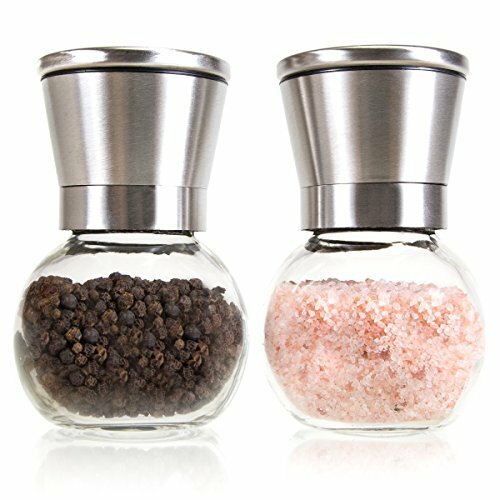 Finally, check whether the pepper grinder can handle other hard spices and whether the salt grinder can be used with different types of salt. These grinders use a ceramic milling mechanism which is tough and guaranteed to last for years without wearing out. The grinding mechanism is located at the top which ensures you don’t make any messes on the table. Each grinder comes with a large 8oz glass jar meaning you don’t have to refill it as often. When you need to refill the jar, just unscrew the metal top to access the glass jar. The jars have a wide opening to make it easier to add salt or peppercorns without spilling them on the floor. Operating the grinder is very easy and doesn’t require a lot of force. Just turn it and it produces perfectly crushed pepper or salt. 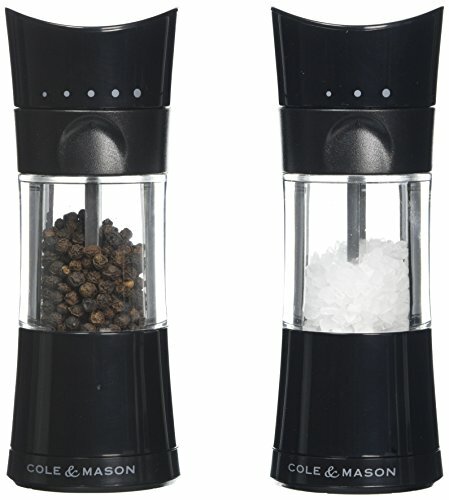 It comes with a grind size setting which allows you to set how finely or coarsely the salt or pepper is ground. Easy to use grinders with adjustable coarseness settings. Includes non-slip silicon stand for both grinders. Durable and non-corrosive ceramic grinding mechanism. 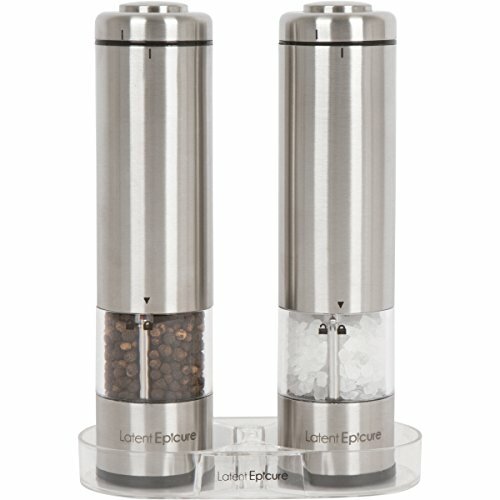 If you cannot or don’t want to use a manual salt and pepper grinder, I recommend this set of battery-operated grinders. Even if you are not getting them for yourself, they are thoughtful gifts for your elderly parent or grandparent. The grinders have an easy one-touch operation. Simply press a button and the grinder mills salt or pepper into the set level of coarseness. There are 6 settings to choose from. You select them by turning the coarseness knob underneath the grinder. The grinders use 4 AA batteries each. The manufacturer recommends that you use non-rechargeable batteries for best performance. Note that the batteries are not included with the grinders. Easy to use battery-powered operation – great for those with arthritis or a disability. Comes with a mill tray to prevent any messes on your working area. Includes LED light to illuminate the food you are flavouring. This set also uses a ceramic grinder. They are tough, long-lasting and can handle a wide range of other spices and salts. The glass jars are extra-big to ensure you don’t have to keep refilling them. This is especially handy if you do a lot of cooking at home. Milling your pepper and salt is a breeze. Just a bit of twisting and the ground condiments come pouring out. You can change their coarseness by adjusting the butterfly screw located at the top. Each jar comes with a plastic lid to keep your salt and spices fresh and moisture-free. These grinders can be used with other spices and salts including cardamom, cumin, Himalayan salt and natural rock salt. No-mess design – the grinder is at the top. Easily adjustable coarseness to suit different recipes and dishes from marinades to sauces. Versatile – can be used with other hard spices and salts. Durable and non-corrosive ceramic rotors that last for years. If you are looking for a grinder that a chef would use in her kitchen, I recommend this set. They not only look stylish and professional, they also perform really well. The mills use precision grinders made from ceramic for the salt grinder and tough carbon steel for the peppercorns. With the manufacturer’s lifetime guarantee, you can be sure these grinders will last for years. The grinders have a convenient upside down design to prevent messes on your surfaces. Grinding is easy and you can adjust the grinding size from coarse to fine depending on your flavouring needs. When the acrylic jars get empty, you refill them from the bottom. There is a lid under the steel base that opens wide, allowing you to add salt or pepper into the jar without causing any messes. The jars are large enough to ensure you don’t need to keep refilling them but are not too big that they are awkward to use. Convenient no-mess upside down design. Long-lasting grinding mechanisms (the grinders come with a lifetime guarantee). This set looks more expensive than it actually is. If you are looking for an affordable but good quality set of grinders, this is a great choice. 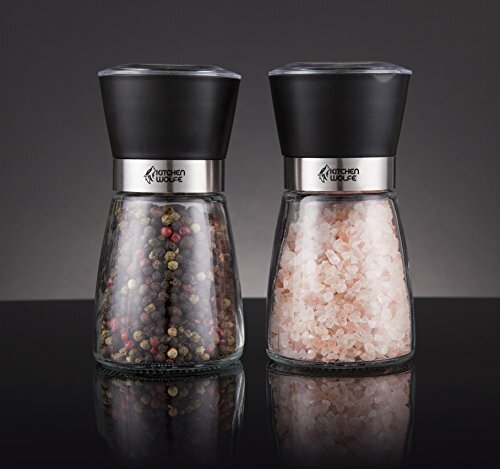 The two salt and pepper grinders use hard-wearing ceramic rotors. The ceramic lasts long and does not corrode like steel. It’s also tough enough to handle tough peppercorns and large salt crystals. You can adjust the rotors to make the condiments coarser or finer depending on which kind of food you are flavouring. The glass jars hold a surprisingly huge amount of salt and pepper. This ensures you go longer between refills. When you need to refill, it is easy and quick. You just need to unscrew the bottom glass sphere. Round shape is easier to grasp even for people with arthritic fingers. The problem with #5 is that the salt one will tend to have the butterfly adjustment seize and then break. I have had 2 of them do this. The ceramic rotor does not last as long as you would think, mine only lasted a year for the pepper one.